Is there anybody willing to donate a scarf to my mate who lives in Gibralter before he flies back Saturday? 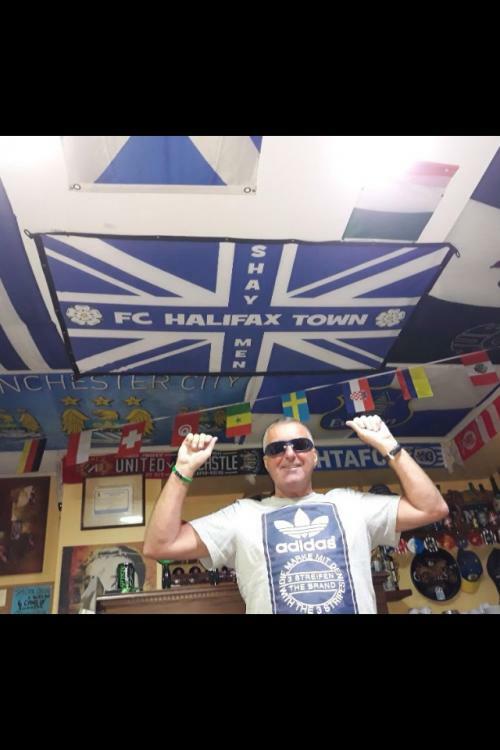 He has been asked by the landlord of his local to bring one back but it must have "Halifax town" on it. I woyld give give him mine but it's a traditional blue and white bar scarf with no words. He already has a flag up over there. Yes, you can have one of Megaphone Man’s. I’ve got a few in the car. I’m sure he would approve. What is the name of the pub? Lived in Gib for three years, went with no kids and came home with two. The border was closed at the time and nothing much else to do other than drink. It'll need to come with some sort of blue plaque too if it comes from his collection! Is it Brian Crowther in the photo? If you're over 40 and from Halifax, you know Brian Crowther. No, you live in sheltered housing Wilder Bollox. That's different. Bertie Mee was manager last time he went. Doe's his brother want one for't Bow-legged while were at it ? Giving this thread a bump. I'm just having a pint with Brian now and he's pestering me and asking if I can get hold of a scarf for him that says "Halifax Town"
I'll be at the game tomorrow so if anybody is kind and polite enough then let us know. It's just so he can put it up in a bar and spread the word round Gibralter. Hes back home for Xmas so hopefully we can get something sorted out. Bertie Mee said to Bill Shankley " Have you heard of The North Bank, Highbury"? Shanks said "No, I don't think so, but I've heard of The Skircoat boot boys"
Skircoat aggro, not boot boys isn't it? It was deffo boot boys! I thought the words were different. Before my time when the song first came about.